Mortgage Referrals are the bread and butter of any successful loan officer’s business, and they are centered around the relationships you make day-to-day. But what helps you remain top of mind when it matters most? 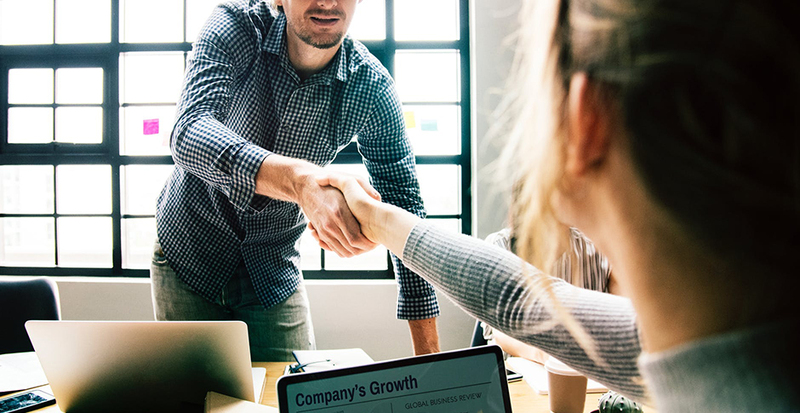 We’ve pulled together our favorite tips to help you continue to land more new clients and remain top of mind with your past clients. Did you know that 60% of customer referrals occur in the first six months after the loan is closed? Because of this, it’s super important to remain in contact with your clients even after the loan process has ended. Creating a simple referral program is an easy way to keep your business moving with minimal effort. You can use both email and direct mail to help you through this process! Start off by reaching out to a client immediately after they submit a mortgage application with a handwritten thank you note. Then, after the deal closes, send another care package and thank you note to show your sincere gratitude. Next, create a “new homeowners care packet.” With this, you should supply contact information for all your favorite local restaurants, shops, and even landscapers, electricians, handyman, etc. When searching for real estate agents to partner with, try to avoid the major agents with tons of listings. These agents most likely have an experience lender they already rely on. Instead, focus on agents with around three to four listings. These agents know how to get the business and will be more open to spending time with you. You can also reach out to recent real estate school graduates. Establish a rapport by offering them classes or one-on-one training sessions that will benefit them as they are learning the ins and outs of the industry. Most quality agents are interested in hearing what’s happening in the industry so they can keep their clients informed. A great way to do this is by sending them weekly updates. As you begin building relationships with real estate agents, it’s important to create a segmented list with all their contact information. Rate updates for example, always interest agents, as well as any updates on significant developments in lending and guidelines. Make sure your content is entertaining and informative. If there’s no new information happening in the mortgage industry, include a couple of paragraphs on things like VA and 203(k) loans. A great way to eliminate confusion in the difficult lending process is to use a product that can record both yourself, and your screen on video. That way you can walk your clients through the difficult paperwork like you were sitting next to them. This helps the agent see that you’re taking care of their clients, and the deal! In today’s market, so many individuals rely on peer-reviews during their decision making process. According to BrightLocal, 91 percent of people regularly or occasionally read online reviews and 85 percent trust online reviews as much as a personal recommendation. With those statistics, it’s imperative for businesses to encourage and equip their customers to leave them positive online reviews. This might not be a new concept, but if not executed correctly, this could lead you to an nearly empty lunchroom, and a moment of embarrassment. How do you prevent this from happening? There are a few main tips that come to mind. First off don’t, these events don’t have to just happen with real estate agents, although we do highly recommend engaging them as well. Get involved with your local community – alma mater, non-profit, college etc. Find your niche, communicate thoroughly with that niche, and educate them on the topic you are skilled in. A good example would be to talk to high schools or college students and teachers about the value of saving money or building and protecting your credit. Make sure your presentation consists of high-quality content, and is of course, entertaining. Get creative with your event name as well. Choosing a name like “Lunch N Learn” will deter people from getting involved. For more tips on how to hold successful lunch n Learn Events specifically for real estate agents, read this article by Mortgage Broker, Tim Davis. Did you know that there are approximately 2 million actively licensed real estate professionals in today’s market — 91% of which use social media on a regular basis? But it’s not just the real estate agents that you can connect with on social media, it’s home buyers. There are multiple ways that you can reach out to future, present and past clients on social media. Whether it’s through a direct message, or a comment, you have the opportunity to create meaningful connections with your sphere. We suggest following and all of your local real estate agents’ pages on social media; and liking, commenting on, and sharing their posts whenever possible. You know what else you can do on social media? Search for relevant events and groups. For example – lookup garage sales in your city. You know who is often holding garage sales? People planning to move. This is a great opportunity for you to reach out to a prospective client by just digging into the purpose of the garage sale, and continuing the conversation from there. Another great way to increase your following is to continuously ask your clients to send you photos from their closing so that you can post it on Facebook and Instagram. Make sure you have their permission to share the photo. Once you receive the photo, and tag everyone involved in the process – meaning the real estate agent, home inspector, insurance agent, title representative, etc, add a caption with a call-to-action to it.. For example – “So excited for the Smith Family and their purchase of an amazing new home! Thinking of buying a new home yourself? Fill out an application at…” That way, your chances of someone sharing the photo are much higher, and you establish credibility! This is a tip we stole from another Mortgage Video Influencer Winner, and BombCast Guest, Eric Peltier. A small step that Eric takes that makes a big difference, is to include the relevant real estate agent on the anniversary video emails he sends to clients. Eric says, “Even if I had no contact with the agent since, I copy the agent on the email.” It’s as simple as cc’ing your colleagues and giving them a shout out in your video. Your colleagues will thank you for doing their marketing for them, and be more likely to remember you for future business. He also reaches out to real estate agents when he gets a lead and asks if he can introduce himself to the client via video. Eric uses the opportunity to speak directly to the client and reference a specific need he can address. Although Eric finds that agents are protective of client’s contact information, they seem happy to send along his videos. You can use this same tactic to get face to face with potential clients without every having their contact information which is also going to help you convert more leads. Technology is actually a great way to help you build your referral network digitally. We recommend using an app like Zapier to pull in referrals. With their workflow automation tool, you can set up your own codeless integrations called “Zaps”. Zaps will automatically send information from one tool to another, so you’ll spend less time manually transferring data between your business tools and can dedicate more focus to creative, big picture tasks. In this situation, you can create a “zap” that will email you whenever a new listing becomes available in your area. Knowing this information offers you the opportunity to quickly reach out to the listing agent on the new property. From there you can try to establish a relationship. Be crafty with your initial reach out, as we mentioned above, agents in many cases have a loan officer that they rely on. Sending a real estate agent a video text or email is a great way to stand out.